The work of arts providers has been put on hold as district and union leadership continue to negotiate around teacher demands for smaller class sizes, more support staff, less standardized testing, and higher pay. LOS ANGELES — As the first week of strikes by 30,000 Los Angeles teachers draws to a close, another group of educators has put their work on hold amidst ongoing contract negotiations between the Los Angeles Unified School District (LAUSD) and United Teachers Los Angeles (UTLA). More than 200 arts providers, which range from major studios to small nonprofit organizations, are contracted by the district to provide programs and services, including supplemental arts instruction, teacher professional development, field trips, and school assemblies. The work of arts providers has been put on hold as district and union leadership continue to negotiate around teacher demands for smaller class sizes, more support staff, less standardized testing, and higher pay. LAUSD, which serves about half a million students, is the second largest district in the US after New York City. LAUSD holds nearly $2 billion in cash reserves, half of which it says has already been earmarked for spending on student programs and teacher pay raises. The Los Angeles County Office of Education, which oversees the district, projects the reserve will fall below required levels by 2020-21, although UTLA disputes these projections. Despite having the nation’s largest economy, the state of California falls below many other states in per-pupil spending in education. State funding for public education suffered significant losses after the state passed Proposition 13, which limits hikes on residential and commercial property tax rates to one or two percent annually, in 1978. School districts throughout California are in a “silent recession,” according to a recent study by nonpartisan research agency WestEd. Among the causes are rising costs related to retiree benefits, employee healthcare, and declining enrollment. The latter is often attributed to the rise of charter schools, which recruit and enroll students who might otherwise be attending school in their local public school district. Districts receive less state funding, which is based on student attendance, as their enrollment numbers shrink. The role of charter schools is another point of contention between LAUSD and UTLA. Inner-City Arts, which provides school-day arts instruction to nearly 6,000 local elementary and middle school students at its campus in Downtown Los Angeles, extended staff development and planning time for its teaching artists during the strike. Credentialed teachers at LAUSD, who are members of UTLA, are required to be present while outside arts providers work with students. As long as teachers are striking, arts providers are unable to deliver school-day programming. Some arts organizations and teaching artists have been more explicit in their support for the strike. Angels Gate Cultural Center, whose artist-teachers serve over 3,600 elementary school students in the Los Angeles Harbor Region, made a decision even before the strike began to suspend programming in support of teachers. One of these artist-teachers is Jayn Ghormley, a San Pedro–based visual artist who has worked with students at Barton Elementary School for three years. Over her decade-long experience as a teaching artist in LAUSD classrooms, she has noticed a reduction in the number of teacher’s aides and the growing number of students in each classroom. The current contract between LAUSD and UTLA contains a clause that gives the district discretion to raise class sizes during fiscal emergencies. Class sizes of 30 or more students are common at LAUSD, exceeding the national average of about 27 students in similar urban districts. In addition to contracting community arts providers, LAUSD currently hires 248 itinerant elementary teachers in dance, music, theatre, and visual arts, as well as 900 secondary arts teachers in dance, film, music, theatre, visual arts, and media arts. Most of these credentialed teachers belong to the union. Learning and teaching in the arts also takes place through arts integration strategies implemented by credentialed teachers who teach non-arts subjects. The district reports that nearly 3,000 credentialed teachers have taken arts integration trainings to help foster learning in both the arts and traditional subjects. The district’s Arts Education Branch has worked to expand year-round arts instruction in all disciplines for its students since budget cuts following the 2008 financial crisis. In 2015, LAUSD released the Arts Equity Index report to determine how the district was doing to make sure English-language learners, foster youth, and students living in poverty have access to the arts. It determined that 75% of schools were underserved or grossly underserved by the arts. Since that time, the district’s arts budget has doubled to over $31 million, but still falls short of pre-recession levels. While the school district and teachers union continue to work on a deal, some teaching artists have taken the time to adjust their programming and plan for when their work with students will continue. 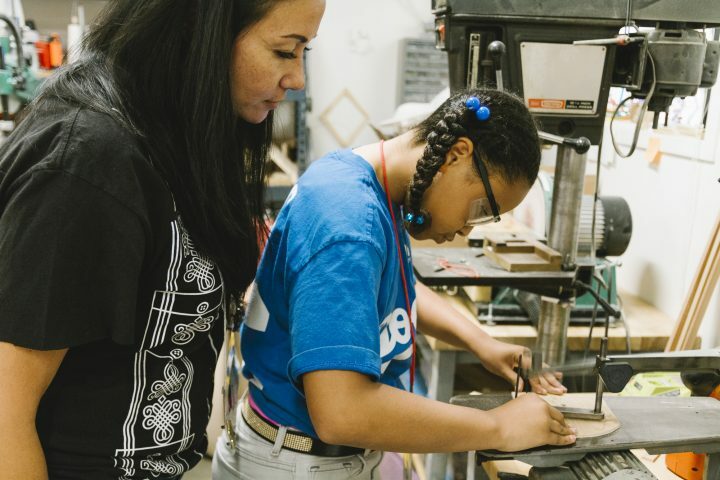 Marissa Sykes is a teaching artist at Inner-City Arts who works in the Creativity Lab, a program for students to work on design and engineering-focused art projects. Over the week, she and her colleagues have been participating in staff development as well as “massive Marie Kondo-style” clean-up and reorganizing. Sykes and many other teaching artists are taking the long view of the strike, hoping that the possible gains outweigh the disruption in students’ day to day lives. The strike might also be a teaching moment and inspiration for young people.